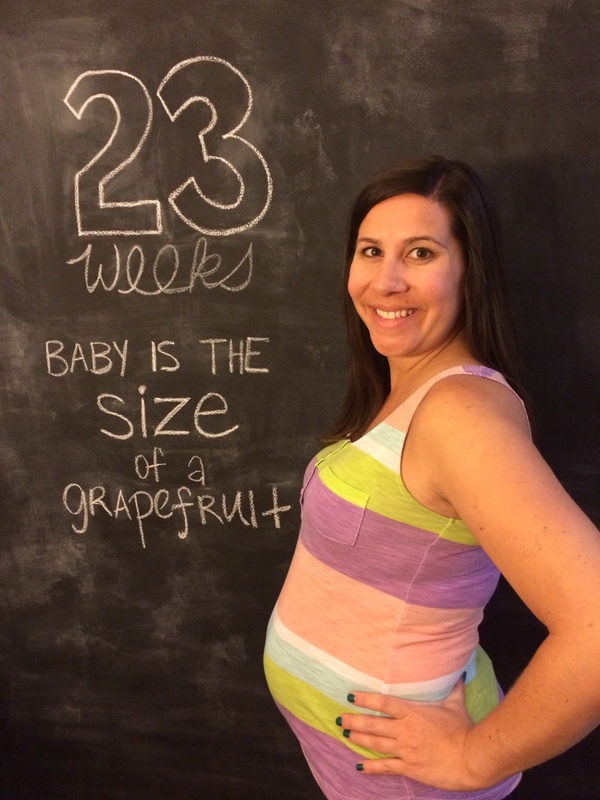 How far along: 23 weeks and the size of a grapefruit – more than 11 inches long and just over a pound. Maternity clothes: Living in mostly non-maternity flowing dresses this week which has been nice. This heat has been intense, and I know it will just get worse as the summer goes on… especially as I get more uncomfortable. Belly button in or out: In.. barely. Sleep: Sleeping ok. I’ve had a more difficult time falling asleep lately because there is a mile long to-do list constantly running through my head. I’m starting to feel a little more stressed about things we need to get done in the next couple of months, and I tend to focus on all of these things late at night for some reason. I also woke up in the middle of the night one night this week in agonizing pain after flipping from one side to the other. It hurt so badly that I started thinking something might be wrong and started googling on my phone – something my doctor told me to NEVER do! 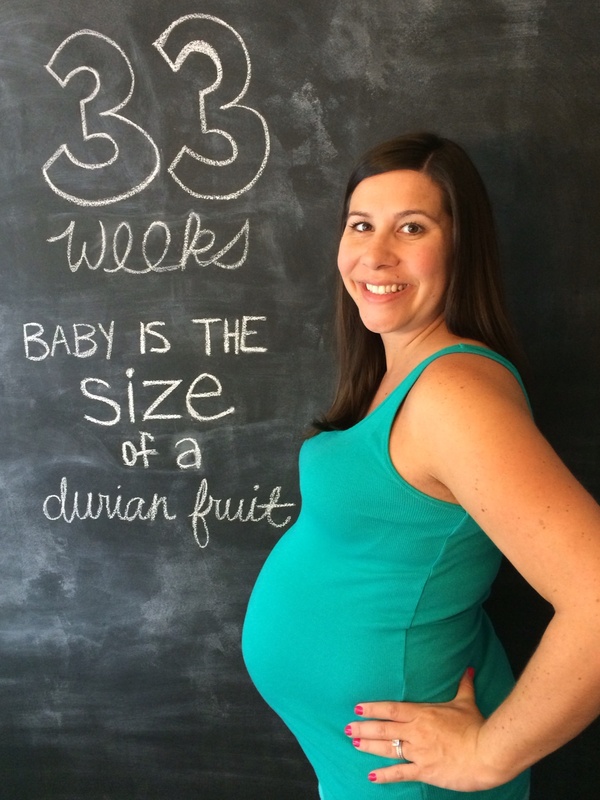 Googling when pregnant brings up terrifying answers for any question you may have. Anyway, I pretty much decided that it was just round ligament pain. I’ve felt it off on on before when coughing, sneezing, or making sudden movements like getting up too fast, but it’s never been that painful or intense. I read that if I try to just lie still for a few minutes and stay calm it should go away, and it did. Best moment this week: Mike finally felt Baby Mully kick last night! He never knows what he’s feeling for, but she was being crazy active last night so I knew he would eventually feel her. It was so cool to finally be able to share that together! Miss anything: Now that these hot summer days are here to stay, I do miss an ice cold beer…. Movement: All day every day! I feel her moving right now. This is one active little girl… I’m starting to wonder if she’ll be the same way after she’s born. If so, I think we are in for a wild ride. Cravings: Cantaloupe is still my current favorite followed by all other sweet fruits, popsicles, and ice cream! Baby Purchases/Gifts: Gap was having a huge online sale this week, so we made our first baby clothing purchase! Baby girl clothes are the cutest! Looking forward to: A week at the beach!! We leave next weekend for Seaside, FL to spend a week in the sun with my family, and I cannot wait! Relaxation, amazing food, the ocean, a few books, and family time is just what this girl needs. We will then leave from there that following Thursday night and head to Tampa to spend the rest of the weekend with my best friends from college. It’s going to be one amazing week! Let the countdown begin…..